For many reasons, women are paid less than men. One is that many women have jobs with more desirable schedules. 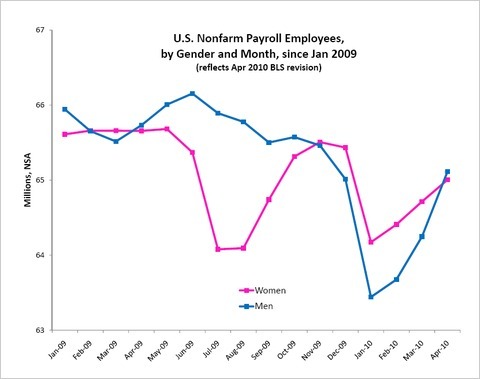 Last week I wrote about how more women than men have been employed in payroll positions during the winter months of this recession, and how in April 2010 men regained their majority, with 50.04 percent of payroll positions. However, if you are reading this between 9 a.m. and 5 p.m., there are probably more women at work than men. 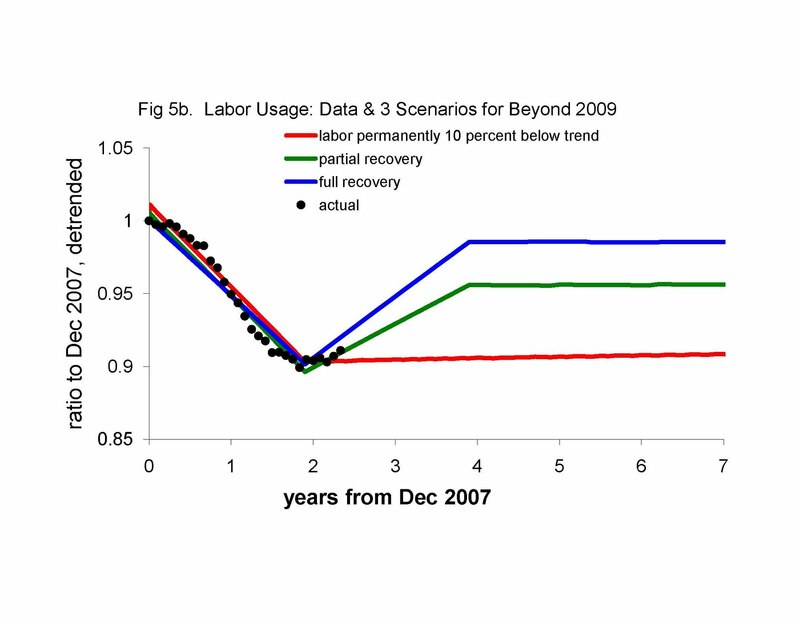 The chart below displays information about the work force by time of day, based on surveys conducted by the United States Census Bureau in 1997, 2001 and 2004 (when the 2010 Census is finished, an analysis like this will be possible for 2010). The calculations in the chart are based on work on gender segregation I have been doing with Christian Ferrada, a University of Chicago graduate student. The black series shows the number of full-time people ages 18 to 65 who are at work in nonfarm jobs at each time of day, excluding people who work from home more than eight hours a week. Not surprisingly, it is vastly more common to be at work between 9 a.m. and 5 p.m. than to be at work in the evening or early morning. 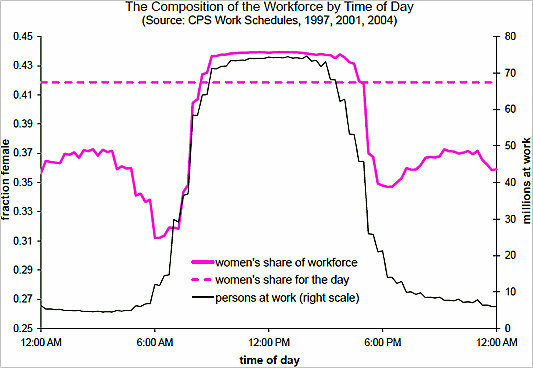 The solid pink series displays the fraction of people at work at each time of day who were women, and the dashed pink shows the fraction for the entire day (weighting by the number of people at work). For example, only 32 percent of people at work at 7 a.m. were women, compared with 42 percent for the entire day. An important reason for the time-of-day pattern of women’s share at work derives from the fact that men are more likely to have jobs that require early arrival at, or late departure from, work. Interestingly, during the middle of the day the female share was 44 percent — two percentage points higher than the average for the entire day during the years studied. Given that 50 percent of payroll employees in April 2010 were female, we might expect that women in April 2010 would be as much as 52 percent of payroll employees at work at any time between 9 a.m. and 5 p.m. — a clear majority. By the same logic, I expect that early in the morning or late in the evening women were nowhere a majority of employees at work, even during this recession when women were often a majority of payroll employees. The vast majority of workers perceive work from 9 a.m. to 5 p.m. to be more desirable than work during the off-hours, and many of the off-hours workers are compensated with higher pay for the less desirable schedule. A variety of factors — including, some economists and many women’s rights advocates say, gender discrimination — may cause women to be paid less than men, but part of the reason may be the hours they choose to work. By one measure, women were a majority of the nation’s work force for the five months ended March 2010. 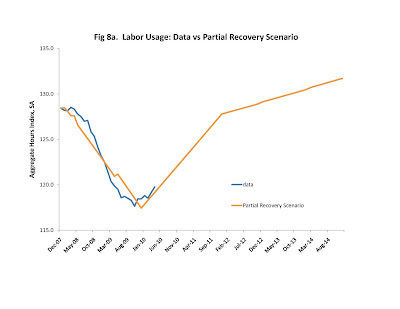 Employment trends suggest they will regain this majority next winter. 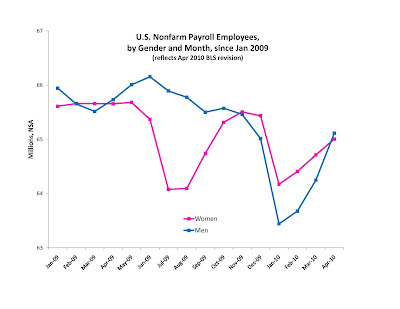 The chart below shows payroll employees by gender since January 2009. 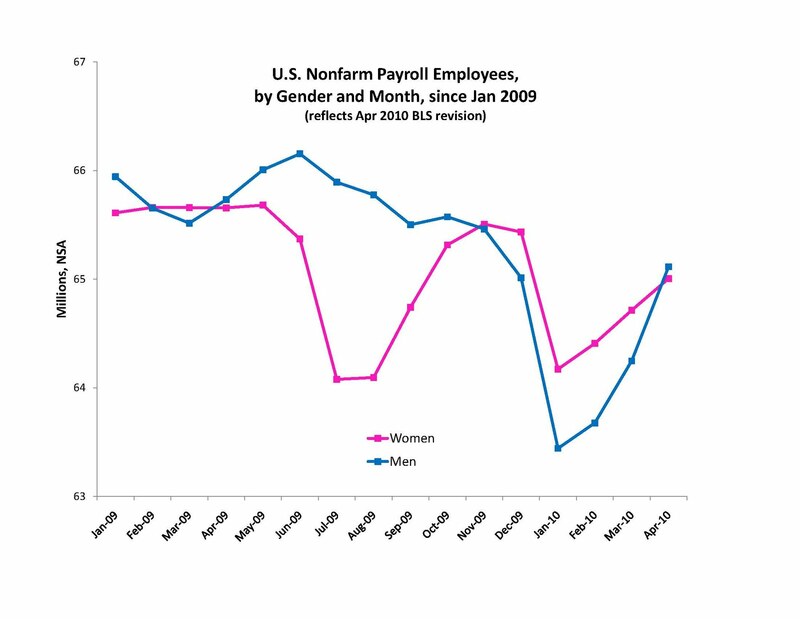 According to the Bureau of Labor Statistics, the majority of the nation’s payroll employees were female in February and March 2009. Women regained their majority status in November 2009 and held it until April 2009, when men held 50.04 percent of the nation’s payroll jobs. Employment follows a seasonal pattern, and a somewhat different seasonal pattern for men than for women. Thus, the summer work force is more male than the winter work force, and it is no accident that women outnumbered men in colder months. 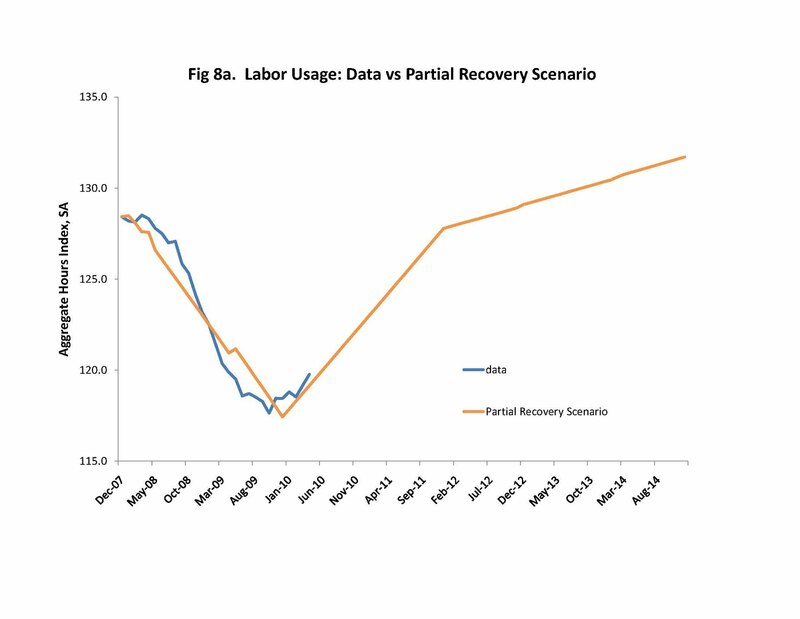 So I expect that men will retain a narrow majority of payroll jobs until next winter. 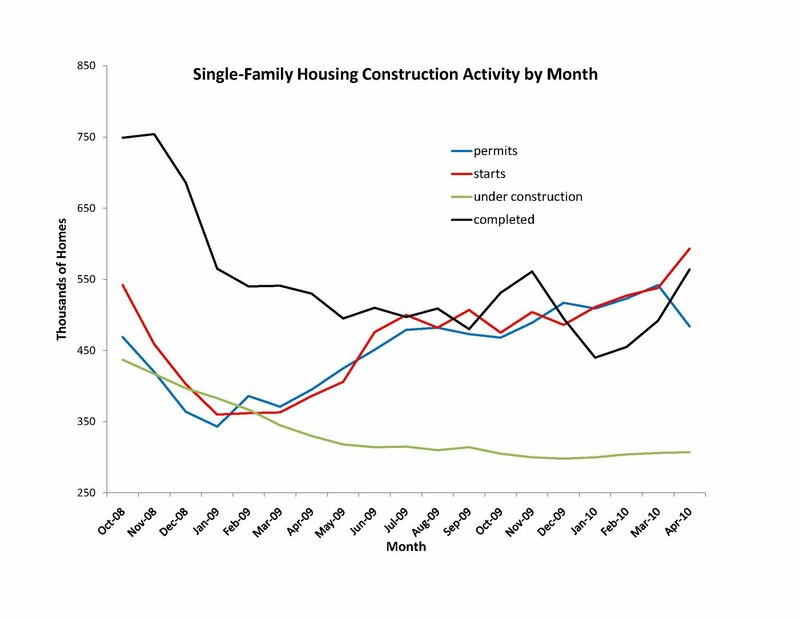 The chart shows that the female majority was larger this winter than it was in the previous one, in large part because almost a million construction jobs were lost in 2009, and the construction industry employs many more men than women. The construction industry will not shed so many jobs this year, but it will take more than a year to recreate the construction and other male-dominated jobs that were lost in the previous year. For this reason, I expect that women will again hold a majority of payroll jobs for several months next winter. Several factors regarding housing supply and demand have changed since the turn of the century and will change in the years to come, in the direction of increasing the nation’s housing inventories. 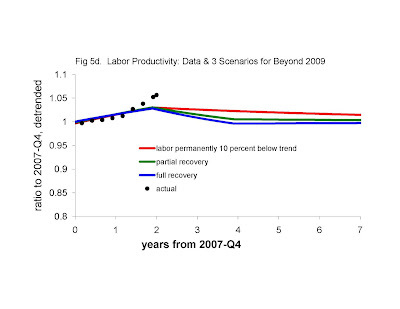 As a result, at least part of the construction boom of the last 10 years served a legitimate economic purpose. 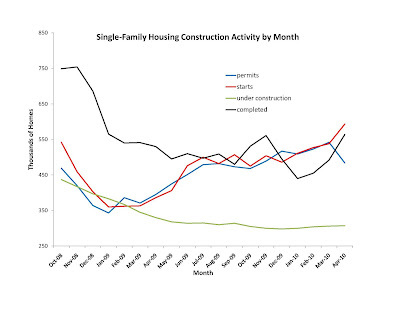 Motivated in large part by extraordinarily high housing prices, the nation’s home builders were busy building and renovating from 2000 to 2006. As a result, the housing inventory at the end of the housing boom was 3 or 4 percent above the trends of the previous decade. 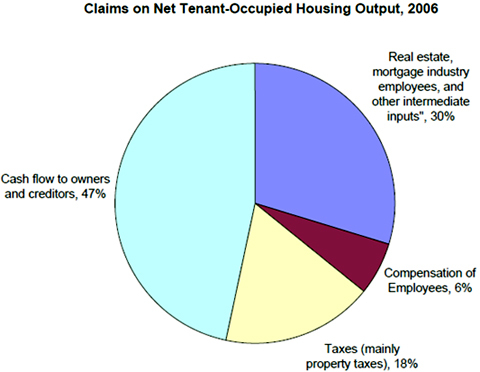 The pie chart below shows the distribution of tenants’ rental payments to various uses. The largest piece of the pie – “cash flow to owners and creditors” – is the amount going to the owner of the home or apartment, and his creditors, that serves as a return on investment. It includes the principal and interest paid on mortgages, and any surplus the owners may have after making a mortgage payment. The other pieces include property taxes, payments to employees who manage and repair the property, and payments for intermediate inputs such as real estate agents and mortgage industry employees. (This last piece does not include principal and interest paid on mortgages, but would include the mortgage closing costs that finance the salaries of industry employees). The “cash flow” piece is an important determinant of housing prices, because the “fundamentals theory” says that homes sell for the present value of the cash flow. The cash flow to owners, and therefore housing prices, would increase if rents increased, so that the total pie expanded. But the owners would also get more, and homes would be worth more, if owners could pay less to real estate agents, property managers, and mortgage brokers. In other words, housing prices can also go up because the entire pie is expected to increase in size, or because the cash flow piece is expected to get larger while some of the other pieces get smaller. An extraordinary population growth rate would be good reason to build houses at a faster pace and would cause prices of housing to increase for occupants. Yet the human population of the United States grew at about the same rate 1995-2005 that it did 1980-95 (about 1 percent per year during both periods, although the total pounds of humans have probably grown more in the recent period). But let’s not forget about the non-humans in our homes – the stuff! 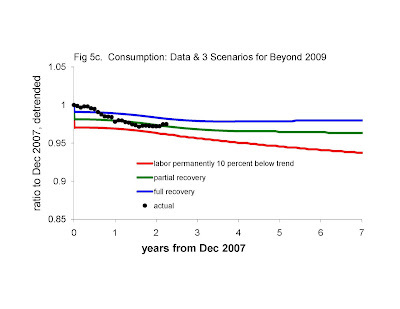 Consumer durable statistics from the Bureau of Economic Analysis confirm the obvious: From 1995 to 2005, ownership of furnishings and appliances increased at a rate of 4.5 percent per person per year (as compared to 2.2 percent in the earlier period), and ownership of recreational goods rose 9.1 percent per person per year (as compared with 5.4 percent earlier). 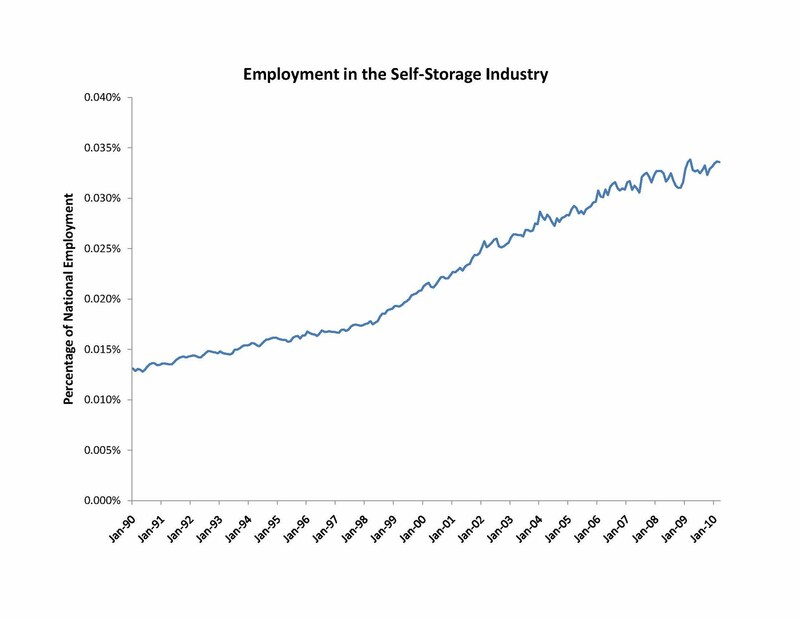 In case you still doubt that Americans have genuinely increased their demand for space, note that the self-storage industry has more than doubled its share of the national economy since 1995, according to employment data from the Bureau of Labor Statistics. Another way to distinguish supply and demand forces is whether they have their effects on owner net cash flows before 2005, or were expected to affect those flows after 2005. 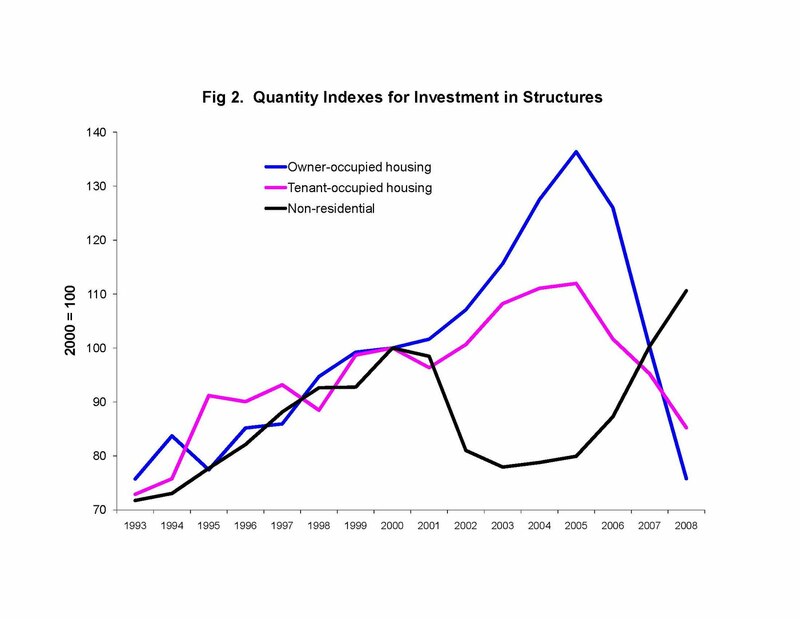 To the extent that houses were more valuable during the boom because of favorable cash flows – perhaps because home occupants had a high demand for space to keep their stuff – rents probably would have risen faster than home prices, because home prices are a kind of average of current and future cash flows. According to the Bureau of Labor Statistics, inflation-adjusted housing rents did increase in the late 1990s and early 2000s, but much less than home prices did. 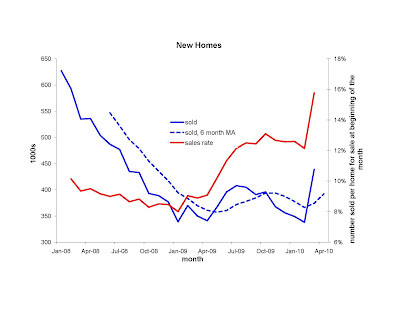 This is why I, and several other economists, have concluded that the majority of the housing boom derived from market expectations about the future, rather than something that happened to housing demand before 2006 (this same logic says that home prices were only moderately stimulated by the fact that mortgage rates were lower in the 2000s than they were in the 1990s: see these items from Professor Paul Krugman and me for more on that point). 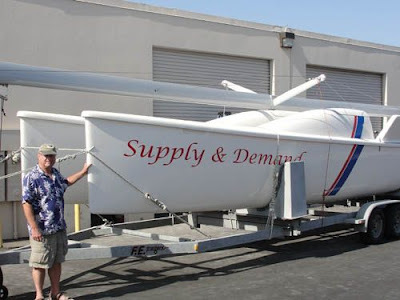 Undoubtedly, Americans will continue to accumulate stuff, and will have commensurate increases in their housing demand, which could partly explain why housing prices increased more than housing rents during the boom. 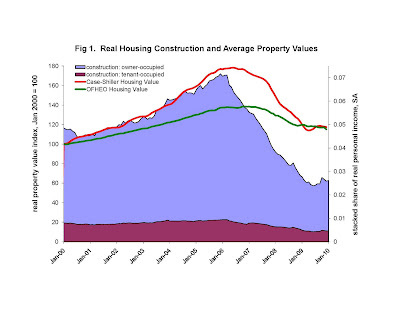 But the accumulation of stuff by itself would be unlikely to produce the housing bust we saw after 2006 because our furniture, clothing, toys, etc., did not suddenly disappear in 2007, but housing prices came crashing down. That brings me to a second set of housing market factors that reinforce the increased demand for space: anticipated advances in information technology. 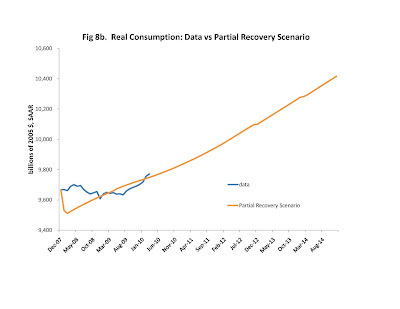 Information technology will likely reduce home ownership costs – shrink the “real estate, mortgage industry employees, and other intermediate inputs” and “compensation of employees” pieces of the pie – but for now we cannot be sure exactly when and how much. House shopping began an ongoing transformation over the past several years, with shoppers able to take spectacular virtual tours of properties. Arguably information technology will someday enable most home shoppers to do without a human real estate agent, and this would be a significant cost savings for home sellers. Don’t forget that a home is built once but typically sold many times, with each sale creating a fee for real estate agents, and many of the sales involving a vacancy period during which no one gets value from the structure. All of these things are expected to someday significantly reduce the costs of owning a home, managing it and keeping it occupied. But it will be years until we know exactly when and how much; in the meantime, the housing market may gyrate as it adapts to these historically rare, but ultimately beneficial, changes. 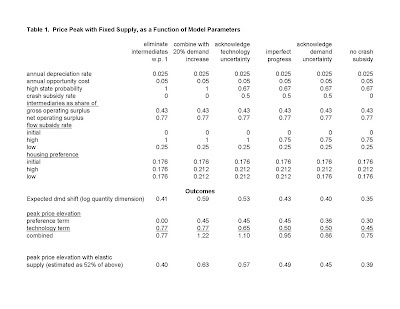 Housing bubble-theorists have not yet seriously considered factors like these. Until they have, it is too early to blame a majority of the housing boom on irrationally exuberant home buyers, because even without these things a historically unusual housing boom may well have been efficient. Housing bubble theorists will offer you a list of reasons why it might have been appropriate to have a bit of a housing boom, and then (perhaps correctly) show you that the factors on their list are not big enough to explain all of the housing boom we actually experienced. The final step in their argument is to attribute all of the unexplained part of the housing boom to irrational exuberance. Of course, the entire argument falls apart if their list is incomplete. For example, do those lists include this? American's incredible accumulation of stuff is real (itself caused by China's seizing its comparative advantage in making that stuff), and the accumulation undoubtedly increased American's demand for space at home. 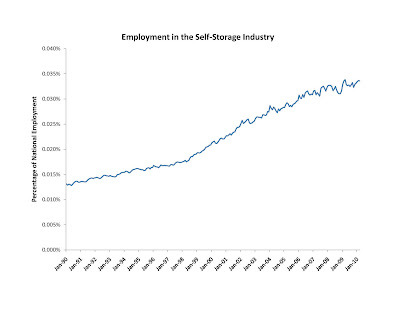 The rise self-storage industry is a reflection of that increased demand for space. Note that I do not claim that the entire housing boom is due to American's demand for closet space. In fact, that's the point: there are any number of things that we may someday understand to explain the residual, and I see no reason why those possibilities are limited to "irrational exuburance." 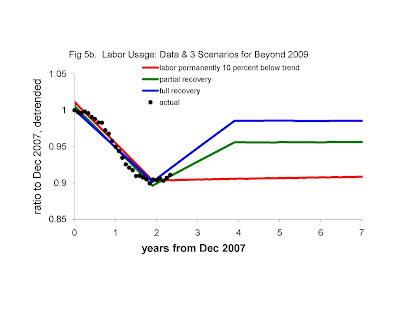 I have written before about statistical analysis of the relationship between Unemployment Insurance and unemployment. Here are some anecdotes along the same lines. 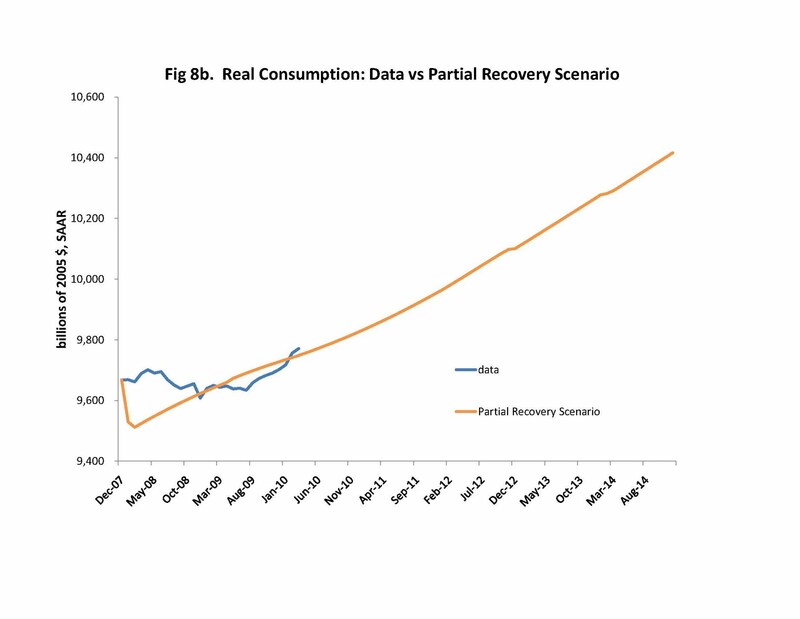 I made these forecasts last fall, and this week we had the release of another month of consumption data (Mar 2010) plus another month of labor data (Apr 2010). 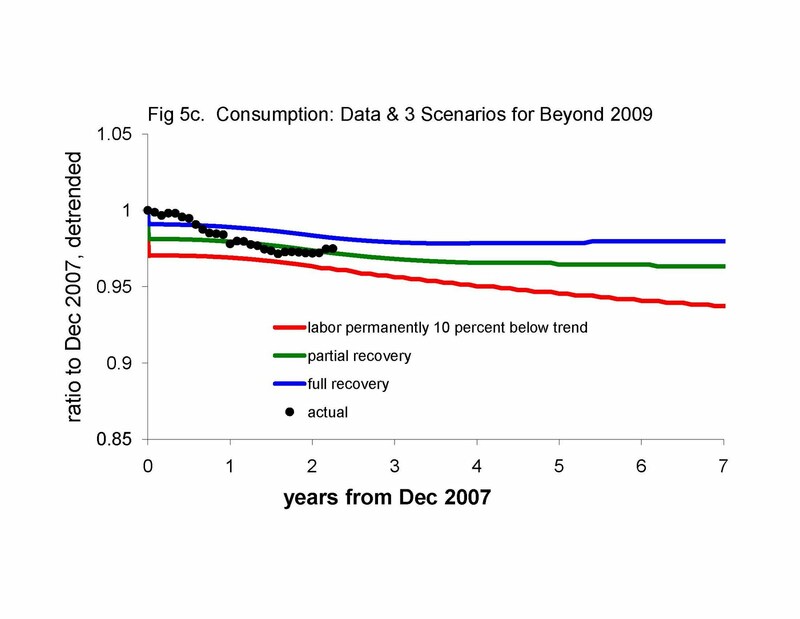 (Recall that the "partial recovery" scenario -- green series in Figure 5b -- is the one I thought would actually happen, in part because it was the only one consistent with consumption patterns in 2008). Men are now 50.04 percent of payrolls, up from 49.82 percent in March. What Does Korea's Development Have in Common With the UK & the US? Find out the answer, based on supply and demand, in Marc Teignier-Baque's The Role of Trade in Structural Transformation. He just earned his PhD at the University of Chicago (the only one wearing the tie)! Are Real Housing Prices Still High? Yesterday I showed how the Census Bureau New Home Price Index, adjusted for inflation, was no lower -- probably higher -- now than it was throughout the 1990s. Remarkably, several bloggers attack the piece on the basis that the Census Bureau index is supposedly not quality adjusted. 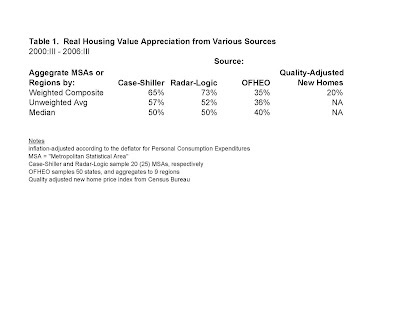 That's a funny claim, because the Census Bureau refers to the index as the "Constant Quality (Laspeyres) Price Index of New One-Family Houses Sold." 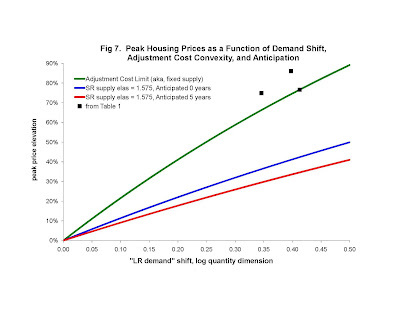 I clearly explained that I chose that index because it dates back far enough to examine other housing cycles (e.g., those in the 1970s and early 1980s), which gives me a historical basis to model how supply and demand would react in various hypothetical situations. But let's suppose that one did not want to engage in such an exercise, and thereby had the freedom to use other indices: my conclusion from yesterday -- that real housing prices are still high by historical standards -- would be even stronger! To see this, compare the end of 2009 with the last quarter of 1999 or the first quarter of 2000 (that's as far back as some of the alternative indices go), as I have in Table 3. The last column of the Table has the index I used yesterday, and it shows the LOWEST 2009 real housing price relative to 10 years ago, with one exception. 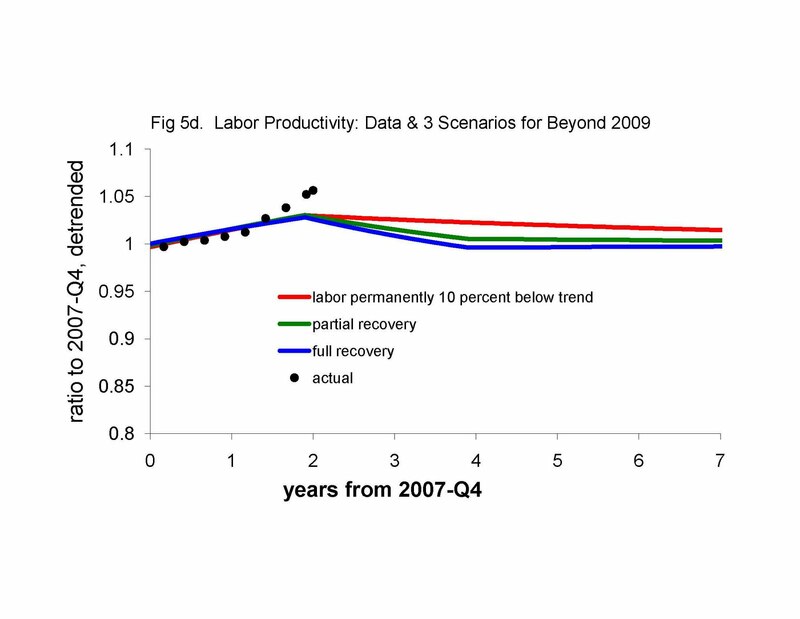 Eight other measures show MORE of an increase over 10 years. 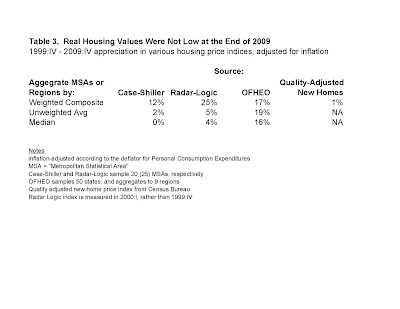 The various national measures disagree much more on the amount by which real housing prices increased 2000-2006, with a range from 20% (Census Bureau quality-adjusted new homes) to 73% (Radar-Logic). A significant part of the disagreement relates to the weighting of the various regions to form the national composite, which is why my Table 3 also reports unweighted averages of the regions, and real price changes for the median region. 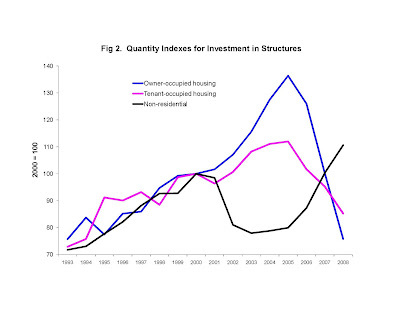 Inflation-adjusted housing prices and housing construction boomed from 2000 to 2006 and crashed thereafter. Commentators ranging from President Obama to Federal Reserve Chairman Ben S. Bernanke have described that cycle as a “bubble,” by which they mean that, at least in hindsight, the housing price boom was divorced from market fundamentals. But maybe there was a good, rational reason for housing prices to increase over the last decade. Bubble theory also implies that the technology for building homes and providing housing is not very different today from what it was in the late 1990s, and so you couldn’t blame the spike in prices on changing building technologies either. In other words, the bubble theory blames rise in prices on animal spirits, and not on any “legitimate” increase in building costs. 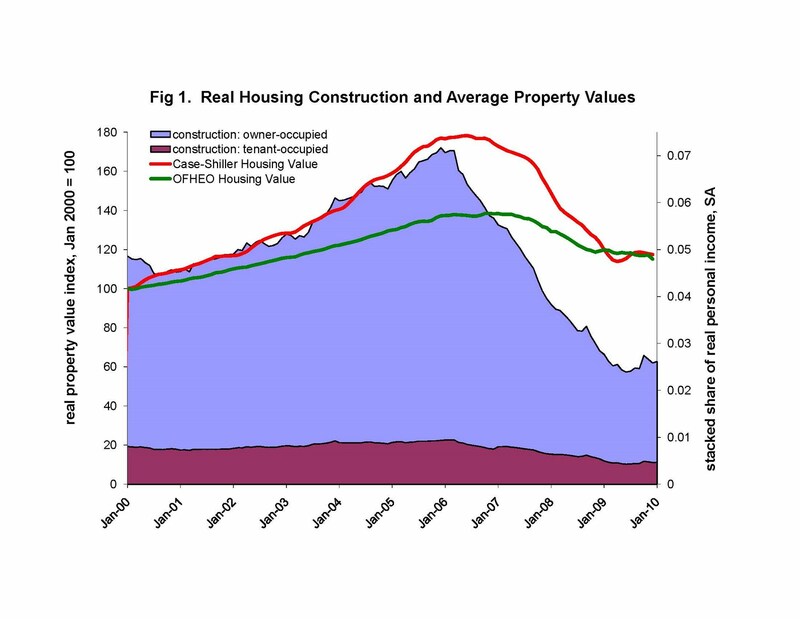 Meanwhile, bubble theorists also say that today America is “overbuilt” as a result of the bubble. With too much housing and no additional demand to be supported by market fundamentals, real housing prices should, according to the bubble theory, be lower today than they were in the late 1990s. A reasonable estimate, based on bubble theory, is that housing inventory is about 3 or 4 percent above what it would have been without the bubble and without the temptation to overbuild. In order to make these excess homes worth buying, prices need to fall further; economists would generally estimate that an extra 1 percentage point of housing inventory requires a matching 1 percentage point decline in price to make those excess homes look like a good deal. So if we believe we had 3 or 4 percent more homes than we really needed last year, based on market fundamentals, that means that housing prices would eventually be about 3 or 4 percent below what they were before the bubble, in order to make those extra houses worth purchasing. 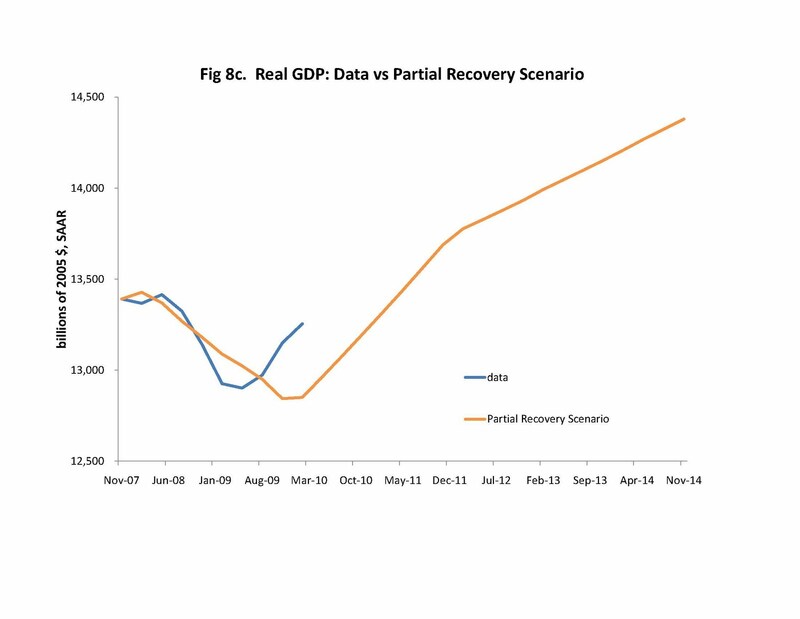 I’ve plotted this path out in the blue series in the chart below. 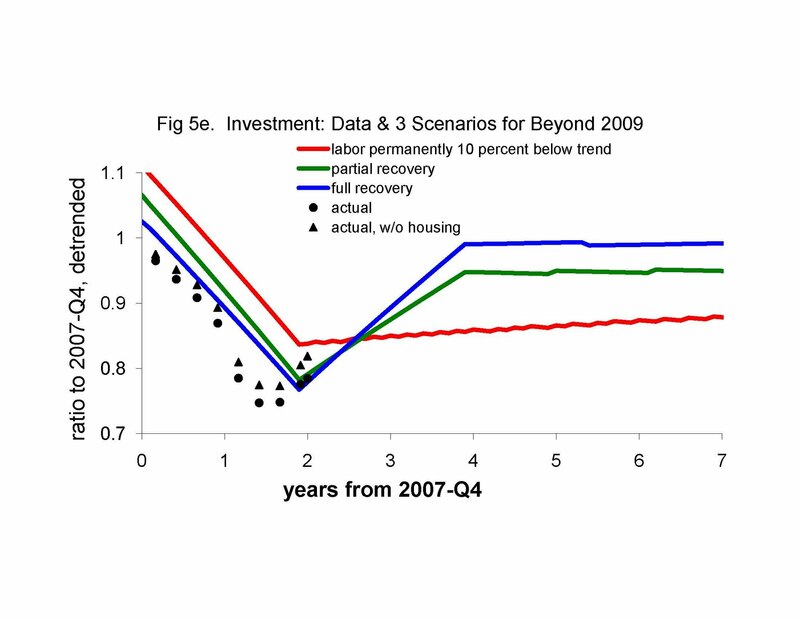 It shows the housing price path one might have expected for 2009 and beyond if housing demand had returned to about where it was before the housing boom. A note: Here housing prices are measured according to the Census Bureau index, which dates back far enough to observe previous cycles, and adjusted for inflation using the Bureau of Economic Analysis’s price index for personal consumption expenditures. The index is normalized so that it is 100 in 1994-97. In other words, a value of “100” for today would mean that inflation-adjusted new home prices are no different today than they were then. 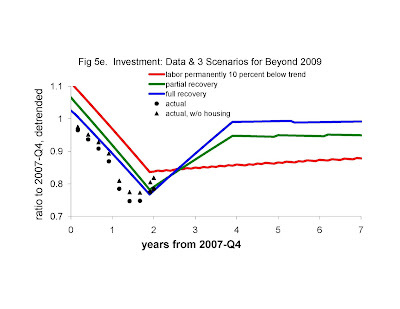 According to the blue series, created using the “bubble theory” premises, real housing prices would be 3 or 4 percent lower now than they were before the housing boom (a value of about 97 for the index) if in fact housing demand were no different, because the “overbuilt” inventory of houses is supposedly 3 or 4 percent greater now than it was then. 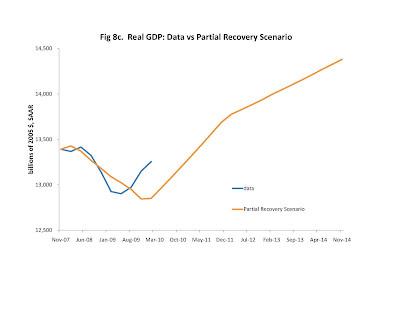 This path approximates what some bubble theorists were expecting last year. For example, during the first half of 2009 Professor Robert Shiller (the same Shiller from the Case-Shiller housing price index) forecasted that housing prices would fall further. Of course, our population continues to grow, so the housing boom’s excess inventory will not last forever as new households form. 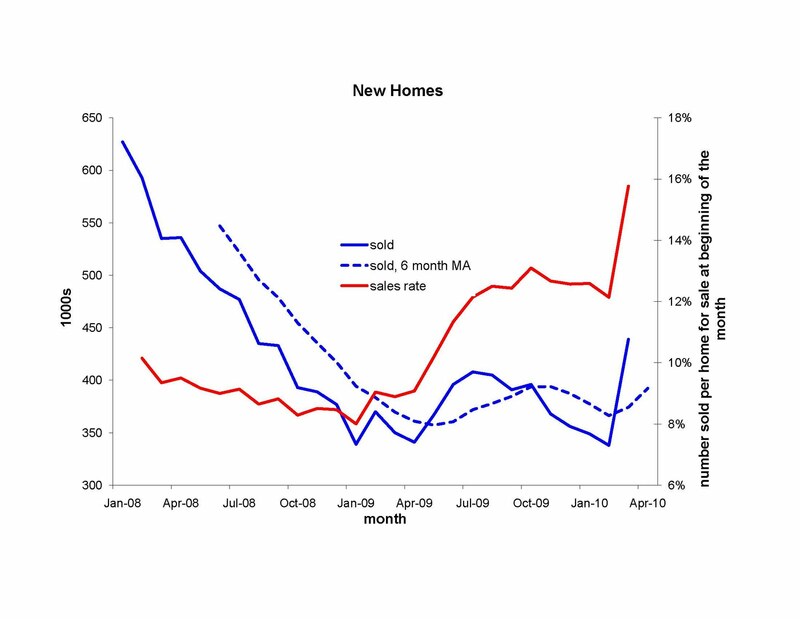 But this process takes a while, which is why the blue series in the chart shows real housing prices returning to normal (a value of 100 for the index) only slowly after 2010. 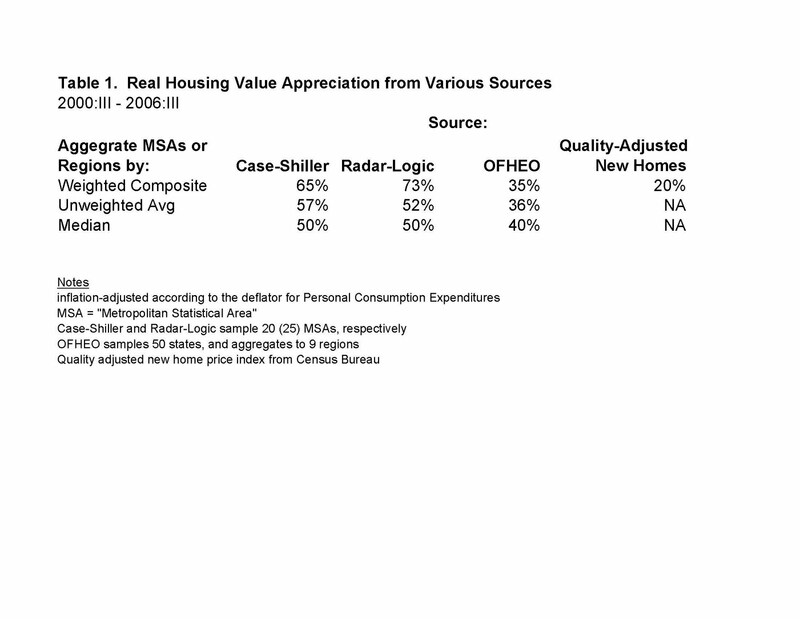 Now let’s turn to the black series in the figure, which shows actual housing prices. Contrary to the blue “bubble theory” series, actual housing prices have risen slightly over the last four quarters, so far remaining well above what they were before the housing boom. Although real housing prices are sharply off their highs, today they appear high by historical standards. Bubble theorists might say that some unfounded optimism lingers in the market place, and that Professor Shiller was just a little early in predicting that real housing prices will soon be significantly below what they are now. But another interpretation is that a large fraction of the housing price boom was justified by fundamentals (and next week I’ll consider some of the specific fundamentals that may have permanently increased housing demand in the 2000s). If so, we are probably asking too much of the Federal Reserve and other regulators to accurately disentangle bubbles from fundamentals the next time that asset prices rise. Economist Gabriel Martinez has studied the evolution of the Mexican labor market, finding that labor market distortions there decreased significantly in the 1980s and 1990s, much of which may be associated from changes in tax laws. See especially his Figure 16. 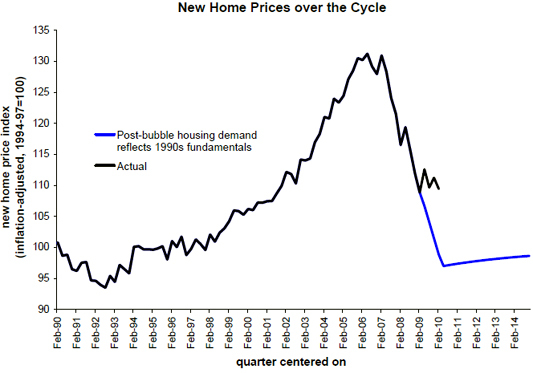 How Big was the Housing Price Cycle? Various housing "price" indices agree than the 2000s had a large housing cycle, with real housing values rising over a prolonged period, and then falling back close to their initial values in just a year or two. 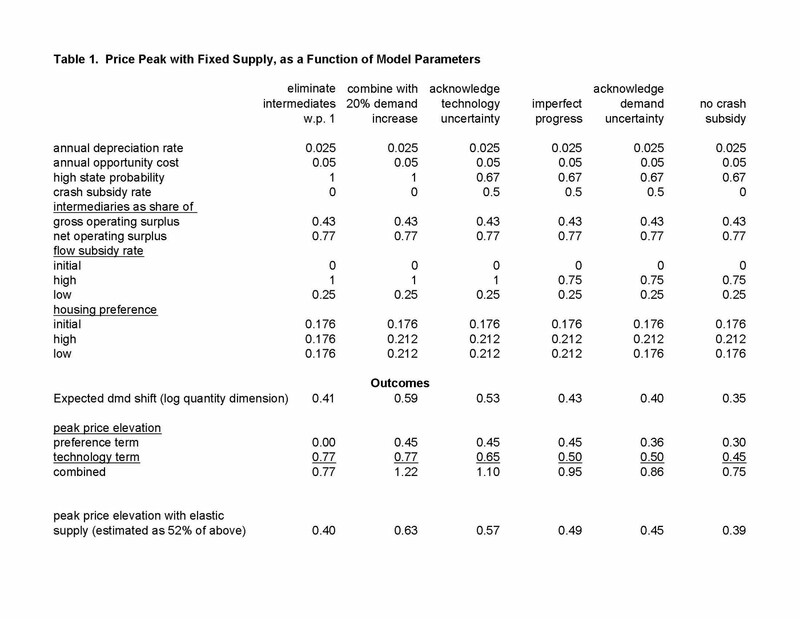 But they do not agree on the magnitude of the price boom, as shown in Table 1. 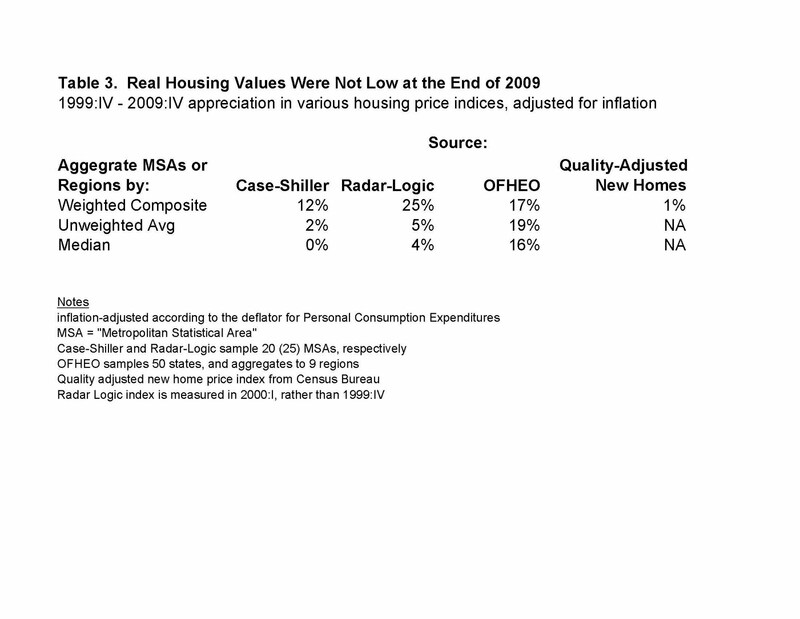 The Table’s ten measures differ in terms of whether they compare same properties over time (Case-Shiller, Radar Logic, and OFHEO), or hedonically adjust new housing prices for measured characteristics (Census Bureau). Table 1 reveals how much of the difference among the same-property indices is related to their aggregation of the various cities or MSAs sampled, because the range of medians is only 10 percentage points, as compared to 38 percentage points for the national composites. 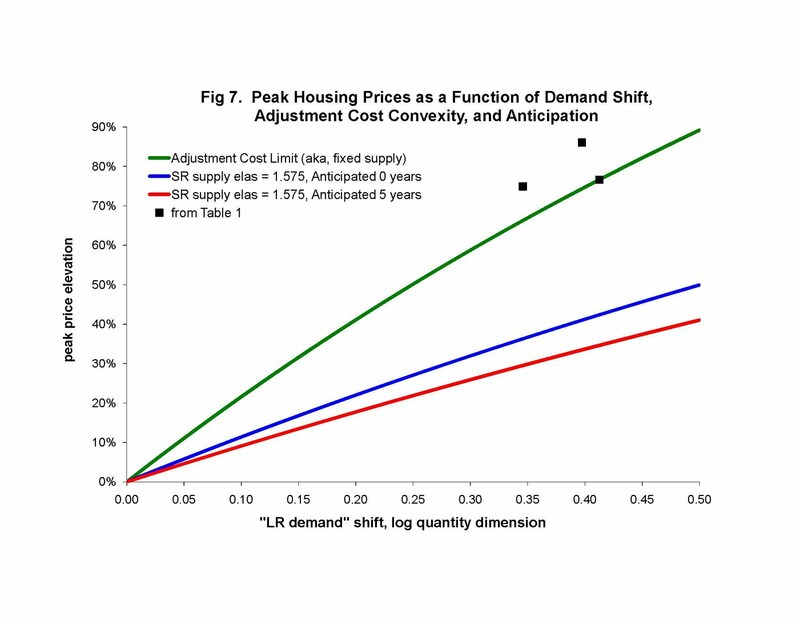 Regional shifts may cause housing prices to rise in some places and fall in others, so I take 40-50% as the size of the housing property value boom to be explained by national factors such as exuberance, monetary policy, or technical change. Moreover, "housing property values" are not the same as "housing prices" because the former also reflects changes in the quantity of housing on a given property and changes in land prices. Conceptually, the Census Bureau's quality-adjusted index of new home prices could well be the best indicator of housing prices, and it shows a 20 percent housing price peak. I think it's safe to say that, from a national perspective, the housing price cycle involve peak housing price appreciation of 20-40 percent.